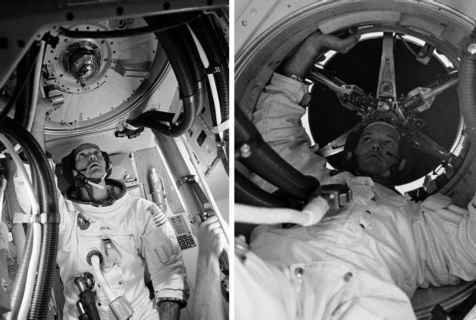 Over the final few hours before entering lunar orbit, the Apollo crews began an exhaustive series of checks and adjustments, interrogating their spacecraft's systems about their ability to sustain life while in the Moon's clutches, and on the engine's readiness to do its job properly. Another important task in the build-up to LOI was to change the spacecraft's knowledge of which way was 'up'. During the 5 or 6 minutes of the burn, the crew wanted to avoid any appreciable errors in the direction of the engine's thrust. Additionally, they needed to ensure that the guidance system could measure the effect of the burn on their velocity. Therefore, as was usual before a burn, the CMP performed a P52 to check the alignment of the guidance platform, but this time special procedures were applied. Up to this point, the platform had been aligned with an orientation, or REFSMMAT,1 that suited the coast to the Moon and made the barbecue rotation easier to set up and maintain. Now they switched to one that suited the LOI burn, obviously known as the LOI REFSMMAT. First, the CMP carried out a realignment to refine the platform in terms of the coasting REFSMMAT, which yielded a measure of its inherent drift. Platform drift was always carefully monitored and no opportunity was missed to gain another data point. With the drift measured, the platform's orientation was torqued around to the attitude in which the spacecraft would make the upcoming burn. By lining up the coordinate systems of the platform and the spacecraft, the crew's job of monitoring attitude during the burn became a lot easier as their attitude displays would be simpler to interpret. It is wise to be certain that your ship is pointing in the correct direction when making major engine burns near planets (especially ones without atmospheres) as a mistake can lead to a crash. Next, they put the entry monitor system (EMS) through a test to demonstrate that it could still accurately measure the change in speed brought about by the burn. This feature of the EMS, its 'Delta-v' display, was one of the redundant methods by which the engine could be commanded to shut down once it had achieved its task. The spacecraft's cooling circuits may, at first glance, appear to be one of the less exotic systems, but if any flaw were to be found in either the main or the backup circuit - especially any leaks formed in the radiator pipes due to micrometeoroid damage - the crew would return directly to Earth; these were next to be checked. More checks followed, covering the caution and warning system, the tanks and valves associated with the manoeuvring thrusters on both the service module and the command module, and the spacecraft's supplies of oxygen, water and power. Having done these essential tasks, the crew could begin to implement the burn itself.